The 2017 Overwatch World Cup finished up with South Korea (reigning champions from 2016) successfully defending its title against Canada. For those who are not familiar with the game, Overwatch is a popular multiplayer first-person shooter video game available for PC, Xbox, and Playstation, based around two teams of six players fighting to try and complete various objectives, depending on the map. Each team receives a chance to attack and complete the objective, and each team receives a chance to defend and try to prevent the other team from achieving the objective. Within each individual game, there is a system where if both teams receive the same score on attack, each team is given a second chance to attack and defend, but with less time. This can happen twice, and if the scores are still tied after each team has had three rounds to attack, the game ends in a draw. Overwatch has just recently reached 35 million players, 16% of which are women, beating out any other FPS titles in female participation. Many players are drawn to the game because of colorful design, which contrasts with the usual dark and bloody warfare of FPS games, and the diverse cast of playable characters. Many demographics often underrepresented in videogames are present in Overwatch, including characters with many different body types, racial features, and personalities. Several of the “maps” in Overwatch, or in-game battlefields you can play on, are based on real locations, while others are imaginary. The appealing overall design combined with engaging gameplay have made Overwatch the sensation that it is today. The game received the Game of the Year award in 2016. Overwatch has recently become an extremely popular game in eSports, and recently the Overwatch World Cup was held at Blizzcon 2017 in Anaheim, California, after group stages across the world narrowed down 32 countries to eight. The matches in Anaheim encompassed playoffs, quarterfinals, semifinals, and finals. At the quarterfinals and semifinals stages, each match is fought over five individual games, with victory going to the first team to reach three wins. At the finals, the match is best of seven games. The 32 countries who were chosen to participate were determined by the skill of their top 100 players, who had their rankings tracked for several months before teams were selected. Once the participating countries were determined, Blizzard formed selection committees of ten nominees each who worked to suggest team lineups and roster picks for the various stages in the competition. From there, votes were taken to establish which players would represent their country. The first quarterfinals match was between Sweden and the United Kingdom, and Sweden quickly gained the upper hand. They swept the United Kingdom team with ease, decisively winning all their matches and ensuring their position in the semifinals. Canada and Australia took the stage next. Australia took an early lead in the first two matches, but Canada emerged victorious in the end after showing impressive coordination on the maps Hanamura, Junkertown, and Nepal. France faced off against China, in what seemed to be an even matchup, but the experience of Team France soon proved superior. Player Dylan “aKm” Bignet’s impressive gameplay on Bastion in the fourth round secured the win for France, ending the match 3-1. The match of the tournament that many were eagerly anticipating was the United States versus South Korea; the final match of the day and potentially one that would decide the winner of the Overwatch World Cup. 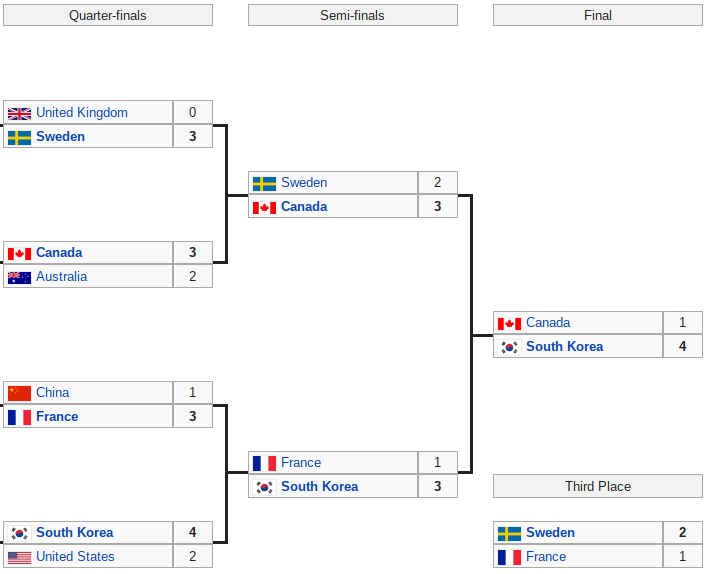 South Korea was the previous champion, but people hoped the United States team could cause an upset. The teams appeared evenly matched, trading back and forth in brutal battles extending several minutes. The first map, Nepal, went to the United States. South Korea quickly evened up the score with a win on Eichenwalde after an incredibly close map. However, the real star of this matchup was the third game, on Hanamura. After both teams managed to see success in their attacks for the initial round, the first tiebreaker round began. Thanks to outstanding play by Jake “JAKE” Lyon using Junkrat, the United States secured a winning score again, but this was soon matched by South Korea when player Yeon-oh “Fl0w3R” Hwang showed incredible sniping skills with the hero Widowmaker. The game went into a third round of overtime, but this time, neither team was able to score anything. The round ended up in a tie. Fl0w3r’s raw mechanical skill brought South Korea the edge it needed to win the final two maps, on Watchpoint: Gibraltar and Oasis, using Widowmaker and Pharah, respectively. This sealed the United States team’s fate, and earned South Korea its ticket to the semifinals. The semifinals kicked off with a strong showing from both Sweden and Canada, with a close match on every map. Canada took the first game, but Sweden quickly managed to get match point by winning the next two. However, Canada beat team Sweden back and won the final two maps and made their way to the Overwatch World Cup finals. Next was a clash between South Korea and France, where both teams had power but South Korea muscled through. They easily won the first two games, but then were thrown for a loop when France managed to nab the third game, on Hanamura, thanks to excellent team positioning, coordination, and Star Tracer player Terence “SoOn” Tarlier managed to keep Fl0w3r in check. However, South Korea took the remaining maps required to win and moved onwards to the finals. The teams from Sweden and France met in a match to decide on who receives third place in the World Cup, with Sweden taking the win 2-1. France seemed to be ahead when they won the first game decisively, but then Sweden showed unexpected power and won both of the next rounds. Finally, teams Canada and South Korea met for an end-all clash in the finals. After some close gameplay on Oasis, South Korea snagged the first map, soon followed by two more wins thanks to the Korean team’s ironclad defense on Kings Row and strong gameplay on Hanamura. However, Canada managed to cause an upset on Junkertown and took out their opponents thanks to Lane “Surefour” Roberts using Bastion in a team composition dubbed as the “pirate ship” due to the concept of setting up the entire attacking team on top of the payload in order to move it to checkpoints. South Korea did win the next match on Numbani, however, and concluded the Overwatch World Cup 2017. After a spectacular showing from all eight teams present at the Overwatch World Cup, the matches and Blizzcon finally ended with South Korea in first, Canada in second, and Sweden in third. There were monetary prizes involved for all teams that participated in the Blizzcon matches; each team received $9,000 USD worth of prizes; $1,500 for each individual member who participated. Additionally, each of the four group stage events (the ones that 32 countries participated in) awarded $72,000. This means the grand prize pool reached an impressive total of $360,000 USD, which is more than $70,000 higher than the prize pool of the previous Overwatch World Cup.